Trying not trying…It’s that perfect balance between casual clothing that is borderline pajamas, and also not looking like you just woke up. It is somewhere in between. Or it’s that casual outfit that you actually took time to make look effortless. Either way, “trying not trying” is a reoccurring theme in my life. We have three reoccurring clothing themes at my house: “Trying not trying,” “classy and cute,” or “thirsty and needy.” There are four of us girls in one house and it’s so much fun. We do runway walks through the hall multiple times a week, and are sure to help one another dress for THE occasion whether it’s work, a casual hangout, or a new date! “Trying not trying” comes into play often around here. “Classy and cute” is more of the date attire we choose and “thirsty and needy” is always vetoed, (because nobody wants to admittedly walk outside in an outfit that screams such things! Let’s be honest, even whispering such things is only borderline acceptable. ;). We like to have a little bit of class -- class and sass! Kara, Grace and I were all talking about how we want to look cute, but wish it was effortless, and like we are not trying too hard. I swear, this is every young woman’s battle! Sometimes we just want people to think we woke up effortlessly, and we want to feel cute and be comfy. Is that even possible?!?! Well, maybe it is for that girl that rolls out of bed, has flawless skin, is skinnier than the models that are airbrushed in magazines, and has the perfect freckle in just the right place…Yeah, that girl ain’t me! I have found that having a couple “go-to” pieces that are comfy and that I know pair together well makes it easier to save time when going for the “trying not trying” look. Grace (my best friend and I) chose outfits for this post that we wear religiously and that are comfortable to be in all day. Me: Sweats (which screams “I’m not trying”). My oversized T is a top I grab often, so that was a no brainer. I added a simple necklace with a pop of color to compliment my top. I also chose “statement shoes.” Without the necklace and the shoes, my outfit is pretty bland. I call the shoes “statement shoes” because they are just that. They have different textures and add some funk to my outfit. They are a statement piece. Grace: Comfy leggings and a generic gray top. She added a third layer--the scarf. It added a different texture as well as a different color, which added a pop to the neutrals she chose as the base of her outfit. She chose cute little socks for warmth, and also because they are stinking cute! They, for sure, add character. Having a few “go to” easy outfits makes it so much easer to manage those days when you wake up on the wrong side of the bed and just don’t want to think about what you are going to wear. You can use the same outfit and change the accessories and it will look like a new outfit. It’s fall and that third layer (an accessory, or a statement piece that adds to your outfit) is easy-peasy. The pop of color Grace chose complements the neutral colors that are the base of her attire. The necklace I selected had a slight pop of color. Accessories are an easy way to seal the deal with an outfit. They add a little something extra that just make the ensemble feel complete! Now do it: check your wardrobe and see if you can implement a third layer this week. It could be a scarf, a necklace or even a kimono or poncho that adds a new texture! Also, see what statement pieces you own. What is screaming all by itself? What do you own that can add a little something extra to a plain outfit and make it more interesting? 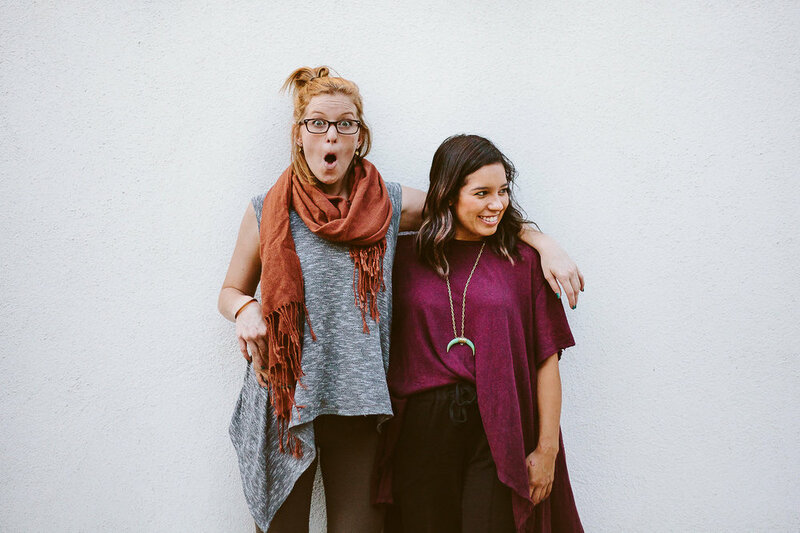 All photos were taken by Kara McFarlane while having copious amounts of fun-because blogging is so much more fun when you get to do it with your best friend!